Traditionally, many people use local storage to manage tokens generated through client-side authentication. A big concern is always a better way to manage authorization tokens to allow us to store even more information on users. This is where Vuex comes in. Vuex manages states for Vue.js applications. It serves as a centralized store for all the components in an application, with rules ensuring that the state can only be mutated in a predictable fashion. Sounds like a better alternative to always checking localStorage? Let’s explore it. For this project, we want to create a vue application that has vuex and vue-router. We will use the vue cli 3.0 to create a new vue project and select router and vuex from the options. Follow the dialogue that shows up, add the necessary information and select the options we need and complete the installation. We will need axios across many of our components. Let’s set it up at the entry level so we do not have to import it every time we need it. Now, when we want to use axios inside our component, we can do this.$http and it will be like calling axios directly. We also set the Authorization on axios header to our token, so our requests can be processed if a token is required. This way, we do not have to set token anytime we want to make a request. When that is done, let’s set up the server to handle authentication. We are using a vuex action — login to handle this authentication. We can resolve actions into promises so we can do cool things with them inside our component. Can you see the Logout link we set to only show up if a user is logged in? Great. We are doing two things — computing the authentication state of the user and dispatching a logout action to our vuex store when a user clicks the logout button. After the log out, we send the user to login page using this.$router.push(&apos;/login&apos;). You can change where the user gets sent to if you want. That’s it. 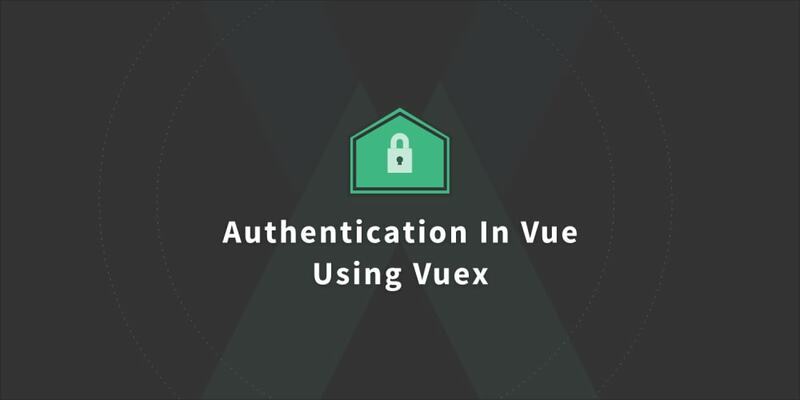 Let’s make the auth module using vuex. If you read past the Setup Node.js Server ****section, you would notice we had to store user auth token in localStorage and we had to retrieve both the token and user information anytime we wanted to check if the user is authenticated. This works, but it is not really elegant. We will rebuild the authentication to use vuex. If you noticed, we have imported vue, vuex and axios, then asked vue to use vuex. This is because we mean serious business here. We have defined the attributes of the state. Now the vuex state would hold our authentication status, jwt token and user information. The login action passes vuex commit helper that we will use to trigger mutations. Mutations make changes to vuex store. We are making a call to the server’s login route and returning the necessary data. We store the token on localStorage, then pass the token and user information to auth_success to update the store’s attributes. We also set the header for axios at this point as well. We could store the token in vuex store, but if the user leaves our application, all of the data in the vuex store disappears. To ensure we allow the user to return to the application within the validity time of the token and not have to log in again, we have to keep the token in localStorage. It’s important you know how these work so you can decide what exactly it is you want to achieve. We return a promise so we can return a response to a user after login is complete. This works similarly to login action, calling the same mutators as our login and register actions have the same simple goal — get a user into the system. Now, when the user clicks to log out, we will remove the jwt token we stored along with the axios header we set. There is no way they can perform a transaction requiring a token now. We use getter to get the value of the attributes of vuex state. The role of our getter in the situation is to separate application data from application logic and ensure we do not give away sensitive information. You would agree with me that this is a neater way to access data in the store ☺️. The whole purpose of this article is to implement authentication and keep certain pages away from a user who is not authentication. To achieve this, we need to know the page the user wants to visit and equally have a way to check if the user is authenticated. We also need a way to say if the page is reserved for only authenticated user or unauthenticated user alone or both. These things are important considerations which, luckily, we can achieve with vue-router. As you can see, we have imported vue, vue-router and our vuex store setup. We also imported all the components we defined and set vue to use our router. Our route definition is simple. For routes requiring authentication, we add extra data to it to enable us identify it when the user tries to access it. This is the essence of the meta attribute added to the route definition. If you are asking ”Can I add more data to this meta and use it?” then I’m pleased to tell you that you are absolutely right ?. From the article on using vue router for authentication, you can recall we had a really complex mechanism here that grew very big and got very confusing. Vuex has helped us simplify that completely, and we can go on to add any condition to our route. In our vuex store, we can then define actions to check these conditions and getters to return them. Because we store our token in localStorage, it can remain there perpetually. This means that whenever we open our application, it would automatically authenticate a user even if the token has expired. What would happen at most is that our requests would keep failing because of an invalid token. This is bad for user experience. We are intercepting axios call to determine if we get 401 Unauthorized response. If we do, we dispatch the logout action and the user gets logged out of the application. This takes them to the login page like we designed earlier and they can log in again. We can agree that this will greatly improve the user’s experience ☺️. From the previous article, you can see the significant changes that get made to our present application based the introduction of vuex. Now, we do not rely on checking the token all the time and having messing conditionals everywhere we go. We can simply use the vuex store to manage authentication state and proceed to check state in our application using only a few lines of code. I hope this helps you build better applications.